This sauce has its origins in Tarragona, Catalonia. It is popularly served with sea food such as being added to fish stew, or with grilled vegetables, crudités, grilled chicken, lamb etc. It also makes for a tasty spread in wraps and sandwiches and a delicious pasta. 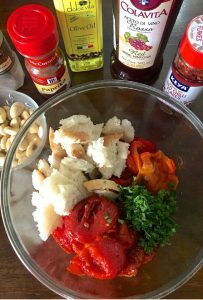 Tomatoes, Nyora Peppers, Almonds/hazlenuts/pine nuts, Olive Oil and Garlic are the basic components that make up the sauce. Nyora peppers are a variety of red bell pepper, small and sun dried. 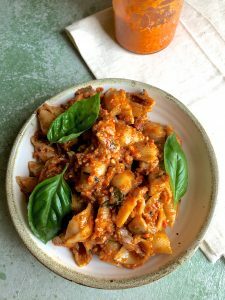 The Spanish Romesco Sauce is a little coarse in texture, nutty and with a touch of spice, and it will be perfect with the pasta I plan to add it to. When you make this Sauce, store bought roasted peppers in a jar may be added, but as you would find for yourself, the flavour of homemade charred roasted peppers is something else. 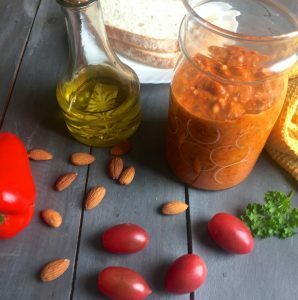 For this Spanish Romesco sauce, I have blanched the almonds for the Spanish Romesco Sauce in order to make them easy to peel, though you could of course add peeled almonds instead. My recipe elsewhere on this blog shows you how to easily peel almonds. Check the link for Badam Halwa, where this process is explained with step by step instructions. Use good quality Olive oil, it makes all the difference to the final taste. 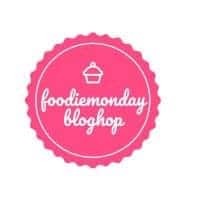 This post is my contribution to the 172nd event of the Foodie Monday BlogHop. This week, the theme was suggested by Mayuri Patel, and most of us voted for ‘International Feast’. 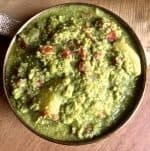 Mayuri stipulated that in this theme, we each prepare a dish from the Country whose name is spelt with the same first letter as our own first name. I, being Sujata, had to cook something from the cuisine of a country whose name began with an ‘S’. Feeling rather woolly headed because of lack of sleep due to a troubling shoulder pain and an even more troubling cough, I did a cursory Google search – I couldn’t think of what I could prepare from Syria, Saudi Arabia, Senegal or San Marino or Saint Kitts! I wasn’t excited about the theme at all, till Mayuri prompted me by saying there are any number of Countries whose name begins with an S.
I glanced over at the cook books in my book shelf and began browsing the recipes in ‘Coming Home to Sicily’. And then it struck me (I told you, I was feeling woolly headed earlier!) what about Spain, with its glorious cuisine, and the opportunity it gave me to cook something special. A few minutes search was all it took after that to freeze on the Spanish Romesco Sauce to accompany my usual weekend Pasta. 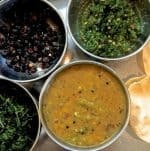 I mentioned Mayuri Patel earlier – an avid and prolific blogger, she blogs at Mayuri’s Jikoni with its many recipes from both Indian and International cuisine. 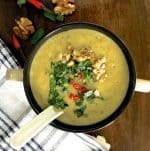 Im sure you would love to browse her blog, as I do, with its colourful vibrant images of great food and easy to follow recipes. 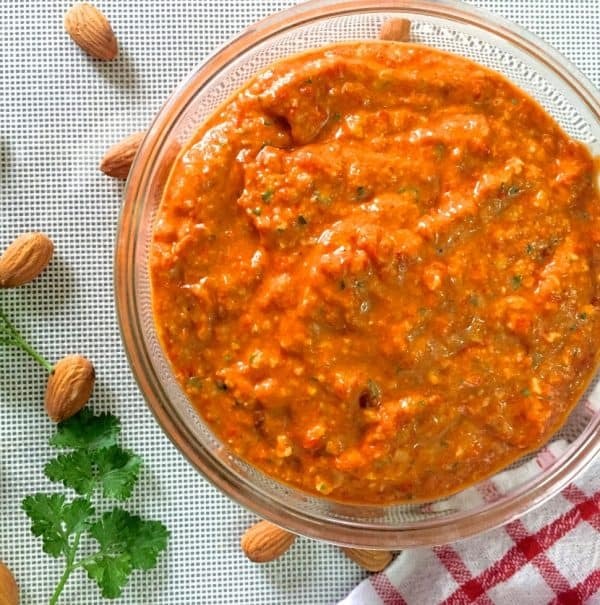 Spanish Romesco Sauce from charred red pepper, tomato and almonds. Easy to make and versatile to use. 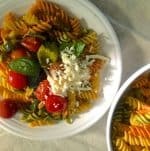 Serve with grilled veggies or chicken or with fish, or as a delicious pesto, with pasta or as a spread. Preheat the oven to 200C / 400 F. Brush Peppers, and Garlic with a little olive oil Slice tomatoes into two and brush with oil and a light sprinkling of salt. Or make two three slits in the bottom of the whole tomatoes and brush with oil. Place whole red peppers, sliced or whole tomatoes and garlic cloves on baking trays lined with parchment and place in the heated oven. Sliced tomatoes to be placed cut side up. Peppers to be place lengthwise. Roast for 20 minutes, by which time one side of the peppers and tomatoes will begin to char. Remove the trays from the oven and turn the peppers and tomatoes over so that the cut side faces down. Remove the garlic cloves from the tray and keep aside. Roast peppers and tomatoes for another 15 minutes. Transfer immediately while hot to a flat surface (I used a flat chopping sheet) and cover with an inverted glass or metal bowl with no gaps underneath. The peppers will steam and the skin will begin to loosen. After about 15 minutes, you can easily peel the peppers and tomatoes. Slice the peppers into two and pull the stem sideways so that the seeds also come out. Peel the skin from the peppers and cut away membranes and remove any seeds left behind. Peel the tomatoes (or leave them if you wish). I don't remove the seeds. Peel the garlic Slice the peeled peppers and tomatoes and crush the garlic. Run the nuts and garlic in a food processor. Add the slices of roasted peeled red pepper, tomatoes, Parsley and blend in the processor. Add half the chilli flakes, smoked paprika, salt and pepper and run the processor. Add the vinegar and half the olive oil in a trickle while it the processor is running. Add more oil till the sauce reaches a runny but slightly coarse and nutty consistency. Once blended, taste for seasoning and add a little more of salt, chilli or paprika as required. Transfer to an airtight container and keep in the fridge till required. Yes Veena, and thank you. I make a variety of sauces now and have completely stopped store bought sauces for my pasta and pizza! I never ever try to use store bought sauce to use in my dishes. 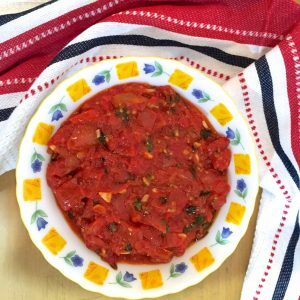 this Spanish Romesco Sauce is definitely going to be add in my to-do list and surely i will try soon di … Lovely share for theme !! Uses flavourful produce by just charring the veggies a bit, bringing out depth and flavour both. I love the take of various cuisines in treating ingredients so wisely and bringing out the best. The charring makes the peppers release sweetness to the dish. 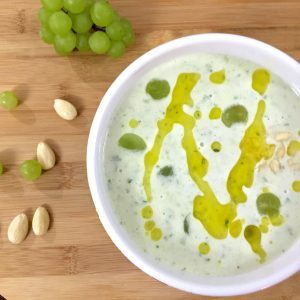 One helluva recipe and I loved it! I would totally scoop this up with pita bread and toss in some pasta, just like you did. Thank you Vidya! Yes, I too love how roasting brings out the flavours of tomatoes, pumpkin, peppers and gives a totally different take to the recipe! OMG Sujata if ever you want a change in career, you should consider writing adverts for restaurants. The way you described the Spanish Romesco Sauce, its making me drool and feel hungry. Then as I scroll down, that pasta dish with the delicious sauce was beckoning me! Just as well you had a jolly head initially…. look at the wonderful recipe you stumbled upon to try out. Thank you Mayuri! I was so hesitant about this theme, and then it’s turned out one of my best recipes! Great idea for a theme! I will love to try this sauce. In fact since kiddo keeps buying pasta sauce she may love to try this sauce. Great share this will go well with sandwiches, pizza, chapatti rolls! Yes breakfast for kiddo will be definitely easy with this sauce. Thanks. Thank you, Archana! Im glad you liked the recipe. You could adjust the spice according to your tastes. Roasted almond tomato garlic Bell pepper sounds finger licking taste. Not only sandwiches or pasta it will be perfect with any Indian snack too. Awesome share. Yes of course you are right, Sujata Roy. My daughter mentioned that she uses them as spread for wraps. I can imagine it would make a great paneer tikka wrap! I love dips and especially with red peppers !! 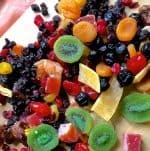 and this is perfect to go with Pita chips or nachos for movie night in this chilly weather!! Thank you Swati! This is now going to be my Go To dip! Thank you so much! Ive made quite a bit and have frozen some for the weekend! 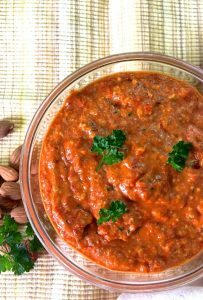 This spanish sauce with roasted red bell pepper , almond, tomatoes sounds so healthy and flavorful di ! Would love to try it as a base for my pizza . Wonderful share di ! Thank you Poonam! Yes it’s such a versatile sauce!